2. Continuing from the previous post, the second point of focus is little 'off' Facebook. Facebook provides set of developer APIs which in their words are ".. powerful APIs enable you to create social experiences to drive growth and engagement on your web site." Notable among them is the Graph API and Open Graph protocol. These APIs can be utilized to extract data like people, photos, events, and pages and the connections between them i.e. friendships, likes, and photo tags. Amazon started tapping into facebook since the middle of last year. If you go to your recommendations, using Facebook Connect, Amazon will now serve you social recommendations based on information in your Facebook profile. The things this 'connect' does is pretty much obvious. But the recommendations can be useful because of actual liking / dislike info it gets from facebook. It is very much like YouTube. YouTube recommends videos according to user's past record of viewing / liking / disliking different videos. Similarly, Amazon copies all information from user's Info page, friends and their Info page. It gets the user's likings of Movies, Music, Books, Activities, TV Shows etc from Info Page and then suggest related books , DVDs and other merchandise from their site to the shopper. Amazon 'connect' has another good feature. It captures user's friends and their information and then suggest gifts to your friends according to their likes and wishlist just before their birthday. Interestingly, Amazon has its own system where shoppers can tell if they own a particular product and get meaningful product recommendations! And this system existed well before Facebook published it's 'Like' widget. Similarly, there are other companies like Levis, Jansport and Wet Seal exploiting the power of social graph. What strategy should you apply? It depends on the nature of your business. For an online business selling books, movies or dvds, I suggest a good strategy will be to utilize the API to glean relevant information about your customers and their network, both implicit and explicit data (likes, info etc) and utilize it to make smart recommendations. The reason is that users are comfortable sharing their likings for such categories and the data is already available! And yes, you need a smart recommendations engine to benefit from this technique! For others, an indirect strategy is required. More on this in my future blogs. Let me warn you beforehand that there will be privacy issues if you adopt this strategy. 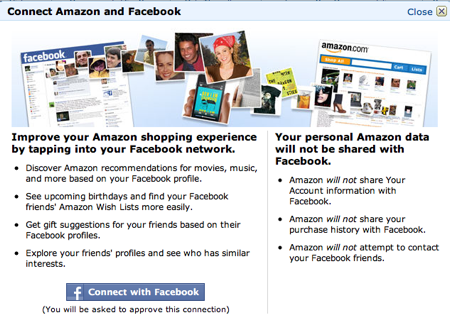 My advice would be to inform your customers on how you plan to use their social network data and stick to this policy. The next part in this series will talk about a smarter way of tapping into the social network. Stay tuned! Tags: Social commerce, sell on facebook, Ecommerce facebook twitter, utilize facebook, social media, promote business on facebook.